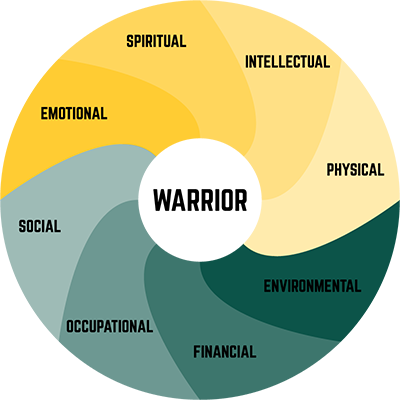 Warrior Life and Wellness is a collaborative effort of on and off campus resources focused on building a healthy community for all Warriors by classifying programs and events into the 8 dimensions of wellness by coordinating a cohesive calendar and programming to foster Warrior Success. Emotional – the ability to understand ourselves and cope with the challenges life can bring. Financial – the process of learning how to successfully manage financial expenses. Physical – the ability to maintain a healthy quality of life that allows us to get through our daily activities without undue fatigue or physical stress. Spiritual – the ability to establish peace and harmony in our lives. Intellectual – the ability to open our minds to new ideas and experience that can be applied to personal decisions, group interaction, and community betterment. Environmental – the ability to recognize our own responsibility for the quality of the air, the water and the land that surround us. Occupational – the ability to get personal fulfillment from our jobs or our chosen career fields while still maintaining balance in our lives. Social – the ability to relate to and connect with other people in our world.